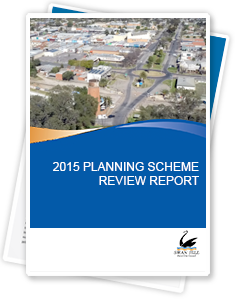 Review of the Planning Scheme every four years is a mandatory requirement under the Planning and Environment Act 1987 Council has commenced the review of its Planning Scheme in July 2015 and has prepared the 2015 Swan Hill Planning Scheme Review Report in consultation with internal staff, Councillors and relevant State agencies. The review also identifies policy gaps in the current scheme and recommends further strategic works to be undertaken. Council at its meeting on 20 October 2015 adopted the 2015 Swan Hill Planning Scheme Review Report, and has submitted the report to Minister for Planning. The recommendations in the report including necessary amendments to the Swan Hill Planning Scheme will be implemented at suitable times.